Derrick Rose will be there in Miami Friday when the Bulls get their first crack this season at the defending champion Miami Heat. But it’s not quite the same, obviously, with Rose sidelined likely another few months recovering from his knee injury and surgery. These were the kind of games you circled the calendar for the last few years, the so-called measuring stick, statement games when the Bulls tested themselves against the conference favorites. Though the Bulls swept the Heat in the 2010-11 season, Miami came on to win the conference finals in five games. Then last season as Rose and LeBron James took turns missing games, the teams split, each winning at home, as they eyed one another for a conference finals showdown that never came because of Rose’s injury. So it’s hardly a rivalry game as the Bulls aren’t considered playoff threats this season because of Rose’s long absence. Still, the series the last few years has produced memorable moments, like Miami players crying in the locker room after the last loss in 2010-11 and then last season James hurdling over John Lucas on one dunk, C.J. Watson hitting a three to send one game into overtime and an eventual Bulls win and Dwyane Wade again losing control and throwing Richard Hamilton into the stands in the final regular season game between the teams. So there is some history there, and though no one among the Bulls wants to talk about it, there does remain a slight hope Rose can return and perhaps upset conventional thinking come playoff time. Obviously, this isn’t the same Bulls team without Rose. But it remains a team quietly competitive in the Eastern Conference at 17-13, just five games behind Miami. 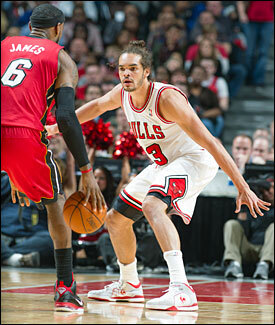 And Joakim Noah, who missed the Orlando game with the flu, should be ready to return Friday. Incidentally, the third All-Star voting returns were released Thursday and Noah remains seventh among front court players in the fan voting. In the Eastern Conference, Wade and Rajon Rondo are locks to be named the starting guards. James and Carmelo Anthony will make it as frontcourt players as the center position was eliminated in this season’ voting. The third frontcourt starter likely will be one from among Kevin Garnett, Chris Bosh and Tyson Chandler. It would help Noah’s case immensely if Chandler gets in on fan voting as Noah has the next highest amount of votes among centers. But Chandler trails third place Garnett by about 75,000 votes and isn’t likely to make that up before the results are announced in two weeks. After the starters are announced, there will be coach voting for the reserves. Noah is generally popular among coaches for his hustling style of play. So he has a good chance to be added, though better if the coaches do not have to add Chandler. The coach voting usually rewards players with winning teams, and New York is second in the East. But it’s also likely the coaches add Josh Smith, who is eighth in the voting just behind Noah. But his Hawks team is a solid third in the East. The coaches also could want to take someone from the Pacers if they continue to play well. And perhaps also the Nets’ Brook Lopez if their record improves as Lopez is the highest scoring big man in the Eastern Conference. Given the Cavs’ poor record, it seems unlikely the coaches would add Anderson Varejao, who leads the league in rebounding. Luol Deng is 13th in the fan voting and it seems most likely the coaches would add one Bull and not two. But if the voting is split, both could miss out. It’s almost certain three players from Miami make the team, though the Heat hasn’t been a particularly dominant team this season for a defending champion. Yes, Miami leads the Eastern Conference at 22-8 and is 15-2 at home. But they aren’t close to being the defense menace they had been or a particularly threatening team. In December, they lost at home to Golden State and on the road to Detroit and Milwaukee before beating the Magic in overtime. James has been truly great, as close as any player ever has been to Oscar Robertson. James is averaging 26.5 points, 8.6 rebounds and 7.1 assists. He’s also the best shooting small forward in the NBA at 54.4 percent. Though we’re still not sure of James’ position. Since winning the championship by playing small, Miami mostly uses Bosh as a so called center, though he isn’t a good rebounder. James, actually, leads the Heat in rebounding and sort of plays every position at different times. James missed the Heat practice Thursday with a knee bruise, though is expected to play. The Bulls didn’t practice with Noah and Vladimir Radmanovic resting from the flu and Kirk Hinrich working off knee problems. 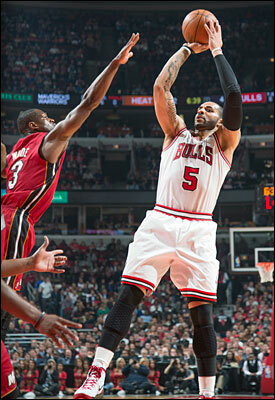 Which is why the Bulls actually matchup pretty well against this Miami version even without Rose. No one is truly a good matchup against James since he came on so strong in the playoffs last season and has continued his dominant play. But in Luol Deng, the Bulls have an active and long armed defender who can keep the Bulls from having to help too much on James. Shading toward James opens up Miami’s three-point shooting as Miami attempts the most per game in the league. As always, the caution against opponents is to keep them out of transition where they’ll dunk and get the home crowd distracted from applying coconut oil. The strength of this Miami team, which is unlike previous Miami teams under Pat Riley and now Erik Spoelstra, is that it is a terrific shooting team and not particularly good defensively. The Heat lead the league in shooting with a team average of 49.2 percent. They are second in three point shooting to the Thunder at 39.8 percent and tops in overall shooting efficiency. But the Bulls are one of the better teams in the league for running players off the three point line, fifth in the league in three point shooting defense at 33.3 percent. The Bulls also are fifth overall in opponent shooting at 43.1 percent. That has been a staple of Miami teams, but this season the Heat is 11th in field goal defense and tied for 14th with Cleveland in three point defense. Also, the Heat is one of the poorest rebounding teams in the league, ranking 29th. The Bulls have slumped of late rebounding, but still are tied for 12th. The notion about the Heat is supposedly that they are so dominant in the East they are cruising during the regular season knowing they don’t have to push themselves to finish first. But it’s also their smallish lineups in which they rarely, if ever, play a center. That has left them badly outrebounded in many games. They make that up with great shooting. Though it is interesting to see a Riley team, even though he is not coach, not embrace rebounding as vital. No center on the Heat roster is averaging more than nine minutes per game. But would Miami try one of them given both Noah and Boozer are in the top 15 in rebounding and Taj Gibson is coming off a 21 and 11 game in Orlando? It gives the Bulls an area where they can attack Miami and also use their perimeter defense to try to run Ray Allen, Shane Battier and Mike Miller off their threes. Plus, Hinrich has a long history of bothering Wade on defense to the point Wade lashes back. You’d like to see Hinrich play him knowing Wade tends to lose his temper and let the Bulls’ shooting guard deal with Mario Chalmers. Assuming Noah is back, he can play Bosh, who tends to shoot outside while Boozer would play Udonis Haslem, who is limited offensively. The Bulls and Heat may not be as meaningful quite yet. But it could be interesting and entertaining.